Every day, Dental Research, like other areas of health care, continues to reveal connections between body health and oral health, as well as improve the health care professional's understanding of how to prevent and treat dental disease. Part of the formula for successfully managing your oral health is to stay informed. Our information center was designed to bring you relevant education and current knowledge about your oral health, so that you can make better dental health care decisions and stay in control. The 2 age groups most susceptible to tooth decay are teenagers and “keenagers” (age 60+). Teenagers from improper diet and poor oral hygiene. Keenagers from decreased saliva flow from medications, exposed root surfaces and decreased manual dexterity. Out of the 200 types of bacteria in the mouth, there are only 2 types of bacteria in the mouth that cause decay: Strep Mutans and to a lesser extent, Lactobacillus. BACTERIAL PLAQUE forms on tooth surfaces. SUGARS are introduced, creating a chemical reaction that creates ACID. The vicious chain continues and the DECAY process continues into the nerve of the tooth, eventually causing pain. 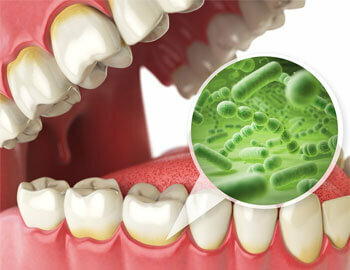 There is a rinse that kills the 2 types of cavity-causing bacteria. There is a type of gum and mints containing a naturally occurring sugar that keeps bacterial plaque from sticking to your tooth and keeps cavities from occurring. There is a type of filling that releases fluoride to prevent decay around the filling and it continually recharges itself to maintain a constant protective “force field” of fluoride. The tooth decay process cannot occur if the oral pH does not drop below 5.5.
pH is greatly is affected by the frequency of meals, snacks and beverage consumption. The increased time that the pH level is below a safe level is more time that the teeth are exposed to decay-causing acids. For Example: Your pH level is more likely to stay below 5.5 (the danger zone) if you sip diet colas all day than if… You drink coffee with cream/sugar at breakfast and have sweet tea with lunch and dinner; only drinking water between meals. Saliva is your #1 personal defense against decay. Most medications decrease the quality and quantity of saliva. There is a simple in-office test kit to determine if you have the adequate flow, pH and buffering capacity to prevent decay. Take our Cavities Risk Assessment to find out where you stand in the fight against tooth decay. Each year, more than 30,000 new cases of cancer of the oral cavity and pharynx are diagnosed and over 8,000 deaths due to oral cancer occur. The 5-year survival rate for these cancers is only about 50 percent. Cancers of the head and neck are mostly caused by tobacco and alcohol, but recent studies show that about 25% of mouth and 35% of throat cancers may be linked to HPV. Mortality from oral cancer is nearly twice as high in some minorities (especially black males) as it is in whites. Methods used to treat oral cancers (surgery, radiation, and chemotherapy) are disfiguring and costly. Avoiding high risk behaviors, including cigarette, cigar or pipe smoking, use of smokeless tobacco and excessive use of alcohol are critical in preventing oral cancers. Early detection is key to increasing the survival rate for oral cancer. Oral cancer today occurs twice as often in males as in females. This is considerably different from the 5:1 male to female ratio of forty years ago. Increased tobacco use among women is the main reason for the change in cancer rates compared with rates in the 1950s. Age is also a factor — 95 percent of oral cancers occur among persons over the age of 40; the average age at diagnosis is 60. Most early signs of oral cancer are painless and are difficult to detect without a thorough head and neck examination by a dental or medical professional. You can help prevent oral cancer by not smoking, using spit tobacco or drinking excessive alcohol. The risk of oral cancer is 15 times higher in those who both smoke and drink compared to non-users of tobacco and alcohol products. Research suggests that eating plenty of fruits and vegetables may safeguard against oral cancer. Because successful treatment and rehabilitation are dependent on early detection, it is extremely important to regularly check your mouth for changes in appearance and see your dentist for an oral cancer screening and regular checkup at least every six months. Survival rates greatly increase the earlier oral cancer is discovered and treated. We perform routine oral cancer screenings during your regular checkup appointments, and encourage our patients to watch for changes in their oral tissues. If you believe you or a loved one may be experiencing any of the symptoms of oral cancer, please contact us immediately. Please Contact Us if you have any questions about your oral health - we want to help!